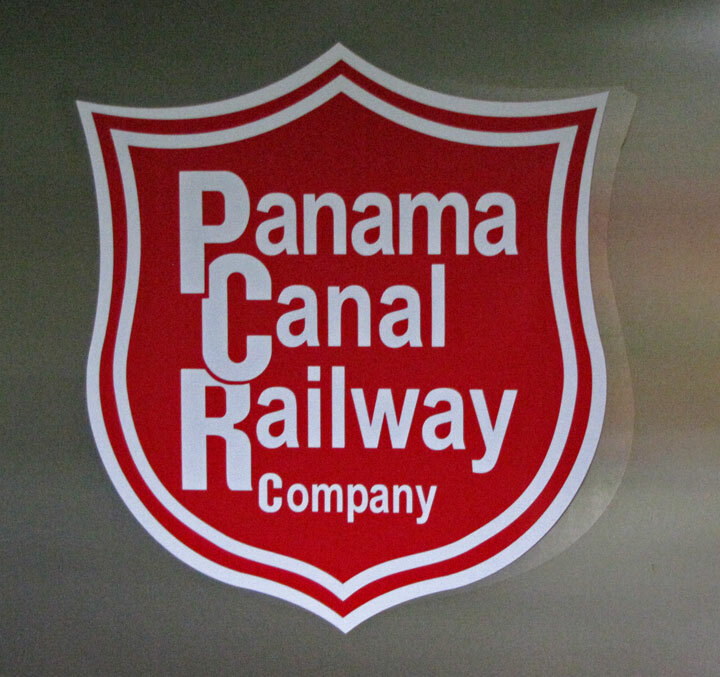 The Panama Canal Railway Company (initialised PCRC) is a railway line that links the Atlantic Ocean to the Pacific Ocean across Panama in Central America. 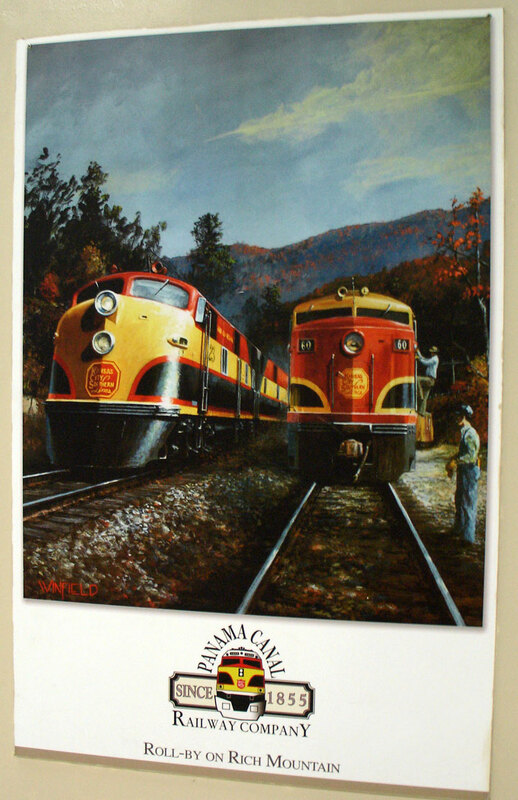 It is jointly owned by the Kansas City Southern Railway and Panama Holdings, LLC. 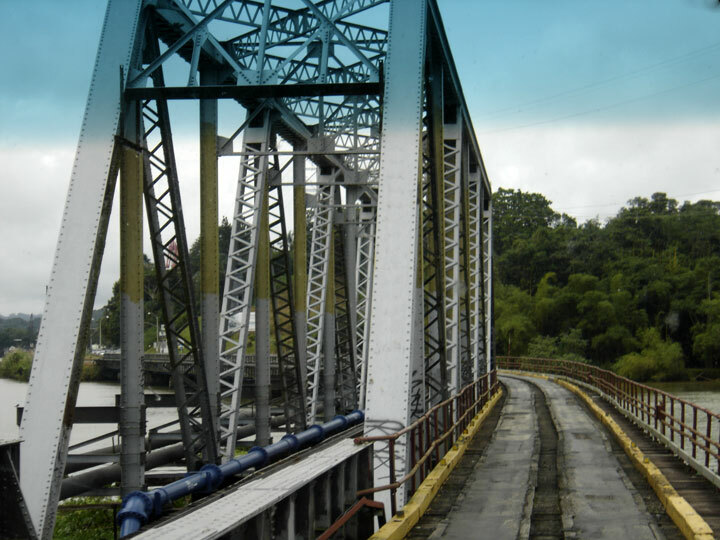 The route stretches 47.6 miles (76.6 km) across the Isthmus of Panama from Aspinwall (now called Colón) to Panama City (by way of Gatun lake, Bujio, Barbacoas, Matachin, and Summit). 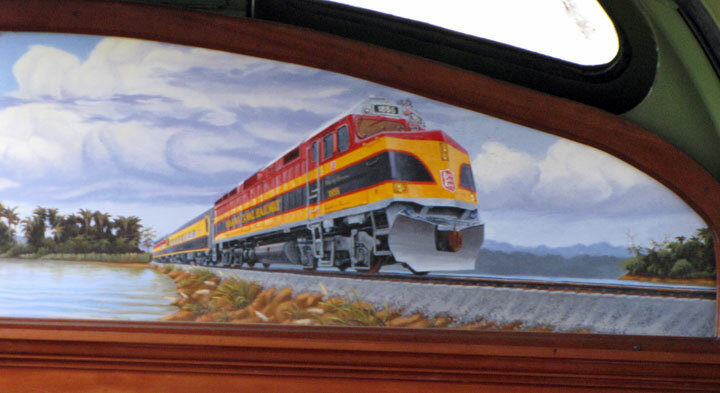 Referred to as the inter-oceanic railroad when opened in 1855, it was later described as representing the world's first "transcontinental" railroad. 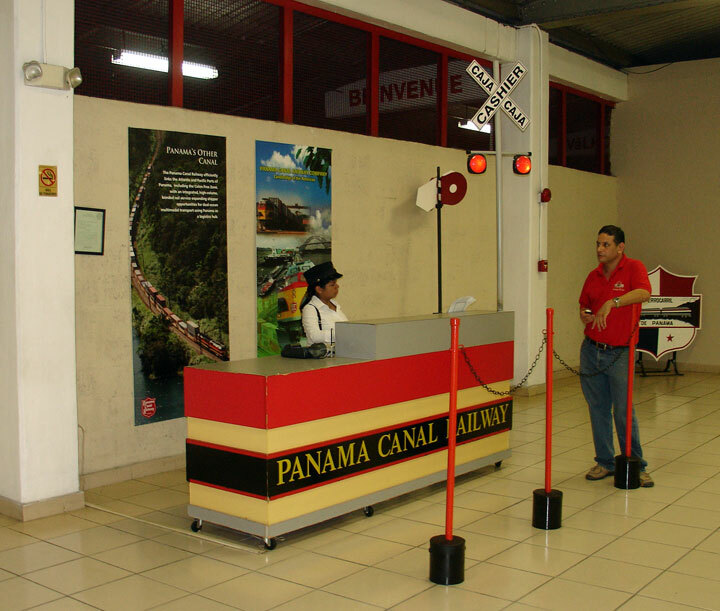 The infrastructure of this still functioning railroad (formerly the Panama Railway or Panama Rail Road) was of vital importance for construction of the Panama Canal over a parallel route half a century later. The principal incentive for the building of the rail line was the vast increase in traffic to California owing to the 1849 California Gold Rush. Construction on the Panama Railroad began in 1850 and the first revenue train ran over the full length on January 28, 1855. While the Camino Real trail, and later the Las Cruces trail, built and initially maintained by the Spanish, allowed some cargo and passengers to be carried across the Isthmus of Panama for over three centuries, by the 19th century it was becoming clear that a cheaper, safer and faster alternative was required. As railroad technology developed in the early 1800s and given the cost and difficulty of constructing a canal with the available technology, a railway seemed the ideal solution. 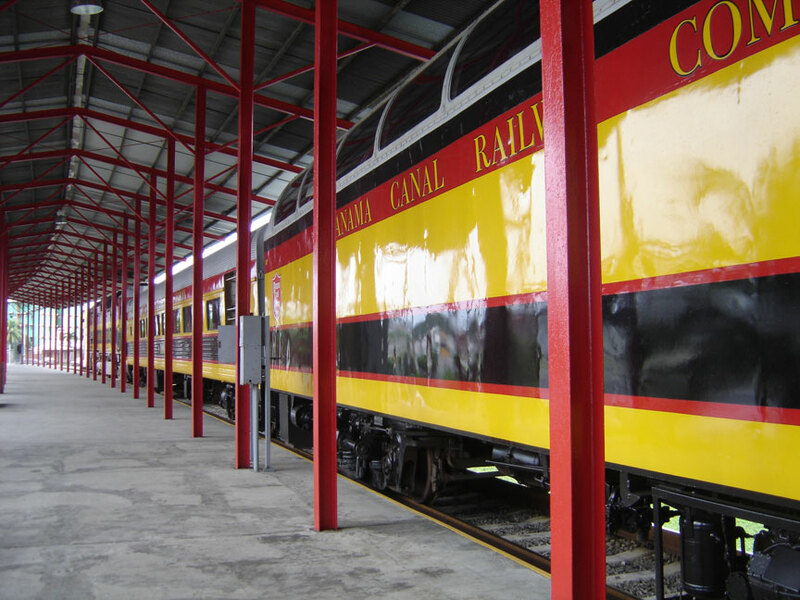 President Bolívar of La Gran Colombia (Venezuela, Ecuador, Panama, Colombia) commissioned a study into the possibility of building a railway from Chagres (on the Chagres River) to the town of Panama City; this study was carried out between 1827 and 1829 (just as railroads were being invented). The report stated that such a railway might be possible. However, the idea was shelved. In 1836, President Andrew Jackson of the United States commissioned a study of proposed routes for interoceanic communication, in order to protect the interests of Americans travelling between the oceans and living in the Oregon Country. This resulted in the United States acquiring a franchise for a trans-Isthmian railroad; however, the scheme was a victim of the business panic of 1837, and came to nothing. In 1838 a French company was given a concession for the construction of a road, rail or canal route across the isthmus. 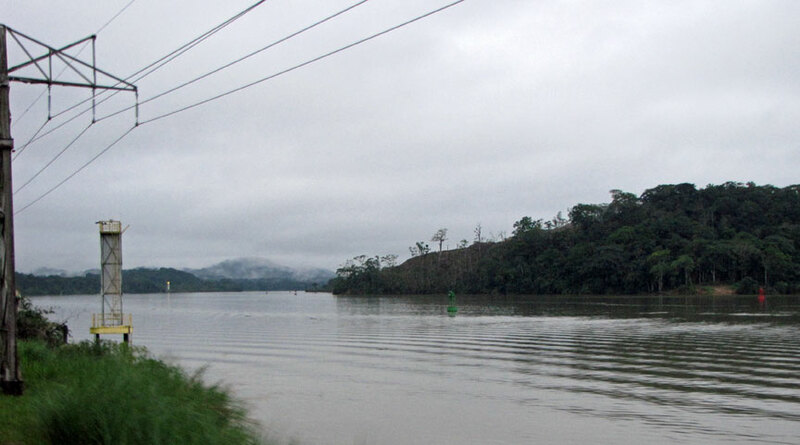 An initial engineering study recommended a sea level canal from Limón Bay to the bay of Boca del Monte, 12 miles (19 km) west of Panama; but the scheme again collapsed for lack of technology and of the several $100,000,000 in funding needed. Following the United States acquisition of Upper California and the Oregon Territory in 1846, and the prospective movement of many more settlers to and from the west coast, the United States once again turned its attention to securing a safe, reliable and speedy link between the Atlantic and Pacific oceans. Congress in 1847, a year before gold was discovered in California, authorized subsidies for the running of two lines of mail and passenger steamships; one in the Atlantic and one in the Pacific. 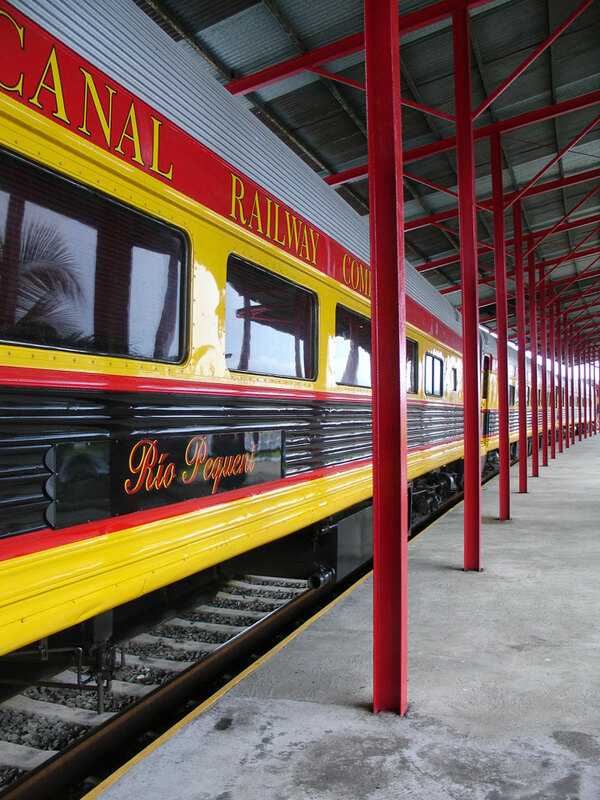 The Atlantic lines ran from New York, Havana, Cuba and New Orleans, Louisiana to the Chagres River Panama on the Caribbean Sea ($300,000 subsidy). The proposed Pacific line ran with three steamships from Panama City, Panama to California and Oregon in the Pacific ($200,000 subsidy). None of the steamships in the Pacific were built before the mail contract was let. In 1847, the actual east to west transit across the isthmus was by native dugout boats (later modified lifeboats were used) up the often wild and dangerous Chagres River and then by mules for about the final 20 miles (32 km) over the old Spanish trails. The trails had fallen into serious disrepair after almost 50+ years of little or no maintenance and up to 3 meters of rain each year in the roughly April to December rainy season. A transit from the Atlantic to the Pacific (or from Pacific to Atlantic) would usually take four to eight days by dugout canoe and mule back. The transit was fraught with dangers and disease. William H. Aspinwall, the man who had won the bid for the building and operating of the Pacific mail steamships, conceived a plan to construct a railway across the isthmus; he and his partners created a company registered in New York, the Panama Railroad Company, raised $1,000,000 from the sale of stock, and hired companies to do engineering and route studies. Their venture was singularly well-timed, as the discovery of gold in California in January 1848 created a rush of emigrants wishing to cross the Isthmus of Panama and go on to California. The first dual paddle wheel plus three masts powered steamship (of three he built) used on the Pacific run was the $200,000, SS California. She was 203 feet (62 m) in length, 33.5 feet (10.2 m) in beam, 20 feet (6.1 m) deep with a draft of 14 feet (4.3 m) and grossed 1,057 tons and when she sailed around Cape Horn South America she was the first steamship on the west coast of South and North America. When she stopped at Panama City on January 17, 1849 (1849-01-17) she was besieged by about 700 desperate gold seekers. Eventually, she managed to leave Panama City January 31, 1849 (1849-01-31) for California with almost 400 passengers and entered San Francisco Bay, about 3,500 miles (5,600 km) later, on February 28, 1849--145 days from New York. There nearly all of its crew except the Captain deserted and it was stranded for about four months before a new supply of coal and a new (much more expensive) crew could be hired. In May 1850, the first sod was turned on the railroad construction; but very quickly, the difficulty of the scheme became apparent. Much of the route was through jungle swamps, the heat was stifling, mosquitoes were everywhere and deluges of rain for almost half the year required some of the workers to work in water up to four feet deep. The swamps were apparently endlessly deep often requiring over a hundred feet (30 m) of gravel backfill to secure a roadbed. The only power equipment they had was the railroad and its locomotives; the rest of the work had to be done by pick and shovel and mule cart. Cholera, Yellow fever and malaria took a deadly toll, and despite the continual importation of large numbers of new workers, there were times when the work stalled for simple lack of alive and semi-fit workers. All supplies and nearly all food stuffs had to be imported from the United States greatly adding to the cost of construction. The project's fortunes turned in November 1851, just as they were running out of the original $1,000,000, when two large steamships with about 1,000 passengers were forced to shelter in Limón Bay, Panama due to a hurricane in the Caribbean. 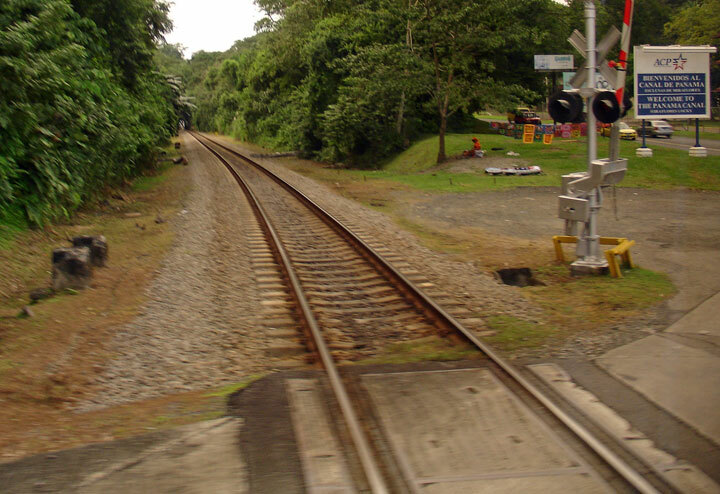 Since the railroad's docks had been completed by this time, and rail had been laid 7 miles (11 km) up to the town of Gatún on the Chagres River, it was possible to unload the ships' cargoes of emigrants and their luggage and transport them by rail — using flat cars — for at least the first part of their journey up the Chagres River. Desperate to get off the boats and across the Isthmus, the gold seekers paid $0.50 per mile and $3.00 per 100 pounds of luggage to be hauled to the end of the track. This infusion of money saved the company and made it an ongoing money maker. 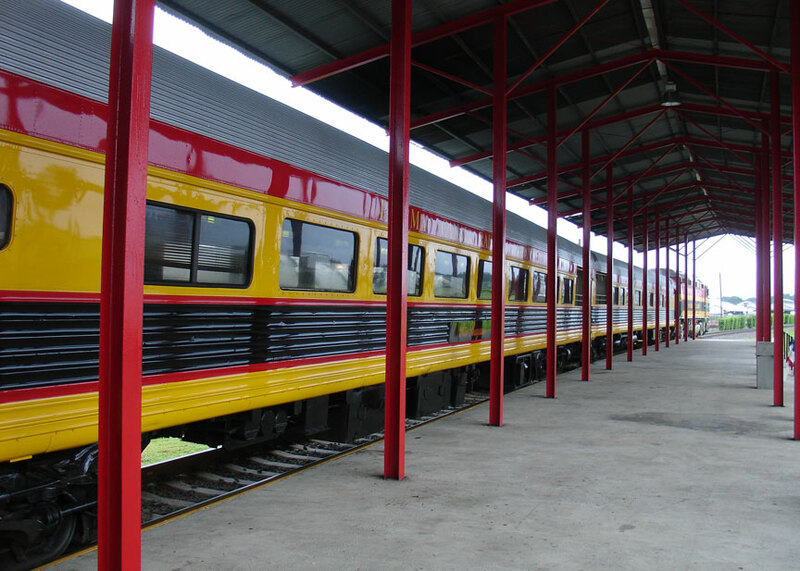 The directors of the company immediately ordered passenger cars, and the railway began operation with initially 40 miles (64 km) of track still to be laid. Each year they added more and more track and charged more for their services. This greatly boosted the value of the company's franchise, which enabled it to sell more stock to finance the remainder of the project which took over $8,000,000 dollars and from 5,000 to 10,000 lives to complete. By July 1852 they had finished 23 miles (37 km) of track and reached the Chagres River where a massive bridge had to be built. The first wooden bridge they built failed when the Charges river rose over 40 feet (12.2 m) in a day and washed it away. They then started work on a much higher 300 foot long massive iron bridge which took over a year to finish. In all over 170 more bridges and culverts had to be built. In January, 1854 excavation began at the summit of the Continental Divide, where the earth had to be cut down over 40 feet. Several months were spent digging this cut. The road over the crest of the continental divide, at Culebra, was finally completed from the Atlantic side in January 1855, thirty-seven miles (60 km) of track having been laid from Colón (then call Aspinwall). A second team, working under less harsh conditions with railroad track, ties, railroad cars, locomotives and other supplies brought around Cape Horn by ship, completed their 11-mile (17.7 km) of track from Panamá City to the summit on the Pacific side of the Isthmus on a rainy midnight on January 27, 1855 (1855-01-27). Lit by sputtering whale oil lamps, the last rail was set in place on pine crossties. The final spike was held in position and George Totten, chief engineer, in a pouring rain with a nine-pound maul drove the spike that completed the railroad. The next day the first locomotive with passenger cars passed from sea to sea. The massive project was done! Upon completion the road stretched 47 miles (76 km), 3,020 feet (76 km) with a maximum grade of sixty feet to the mile (11.4 m/km or 1.14%). The summit grade, located 37.38 miles (60.16 km) from the Atlantic and 10.2 miles (16.4 km) from the Pacific, was 258.64 feet (78.83 m) above the assumed grade at the Atlantic terminus and 242.7 feet (74.0 m) above that at the Pacific, being 263.9 feet (80.4 m) above the mean tide of the Atlantic Ocean and the summit ridge 287 feet (87 m) above the same level. They now had the job of making things permanent and up grading the railroad. Hastily erected Wooden bridges that quickly decayed in the tropical heat and often torrential rain had to be replaced with Iron bridges. Wooden trestles had to be converted to gravel embankments. The original pine ties only lasted about a year and they had to be replaced with lignum vitae ties, a wood so hard that they had to drill the ties before nailing the spikes. The railway cost some $8 million USD to build (eight times the initial estimate in 1850), and presented considerable engineering challenges, going over mountains and through swamps. Over 300 bridges and culverts needed to be built along the route. It was built and financed by private companies from the United States. Among key individuals in building the railway were William H. Aspinwall, David Hoadley, George Muirson Totten, and John Lloyd Stephens. 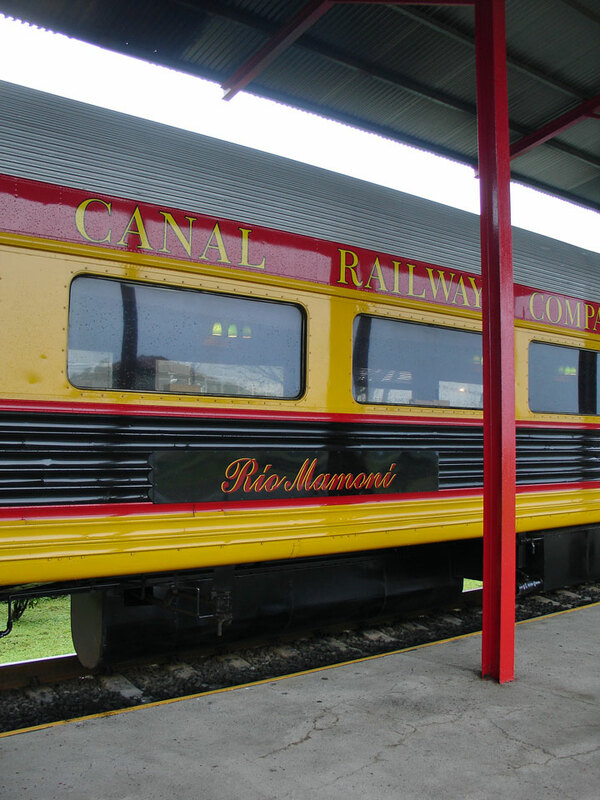 The railroad was built and originally owned by a publicly traded corporation based in New York City, the Panama Rail Road Company, which was chartered by the State of New York on April 7, 1849 (1849-04-07), and the stock in which would eventually become some of the most highly valued of the era. 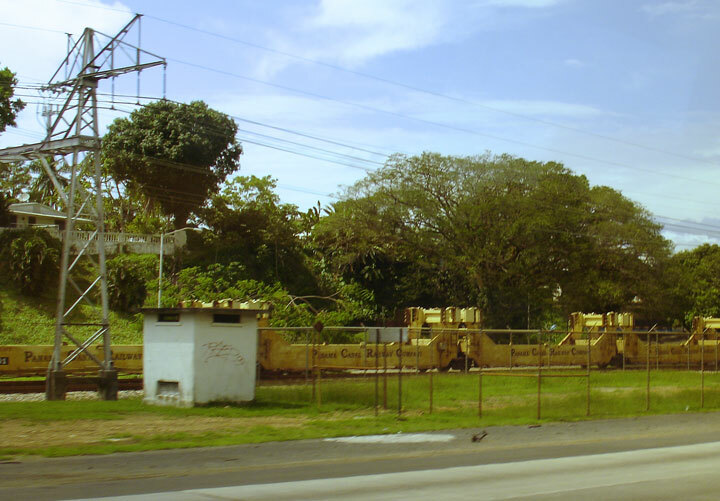 The company bought exclusive rights from the government of Colombia (then known as Republic of New Granada of which Panama was a part) to build the railroad across the isthmus. The railway carried significant traffic even while it was under construction, with traffic carried by canoe and mules over the unfinished sections. This had not been originally intended, but people crossing the isthmus to California and returning back east were eager to use such track as had been laid. When only 7 miles (11 km) of track had been completed the railway was doing a brisk business, charging $0.50/mile per person for the train ride--increasing to $25/person when the line was finally completed. By the time the line was officially completed and the first revenue train ran over the full length of its grade on January 28, 1855, more than one-third of its eight million dollar cost had already been paid for from fares and freight tariffs. The fare for first class passage was set at $25.00/ one way--one of the highest rates in existence for a 47 miles (76 km) ride. High prices for carrying freight and passengers, despite very expensive on-going maintenance and up grades, made the railroad one of the most profitable in the world. 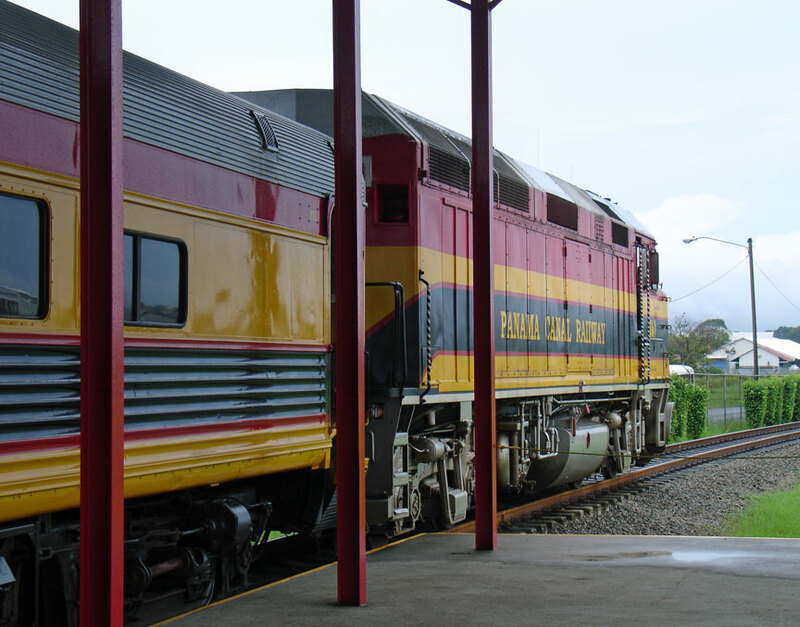 Engineering and medical difficulties made the Panama Railway the most expensive railway (per unit length of track) built at the time. 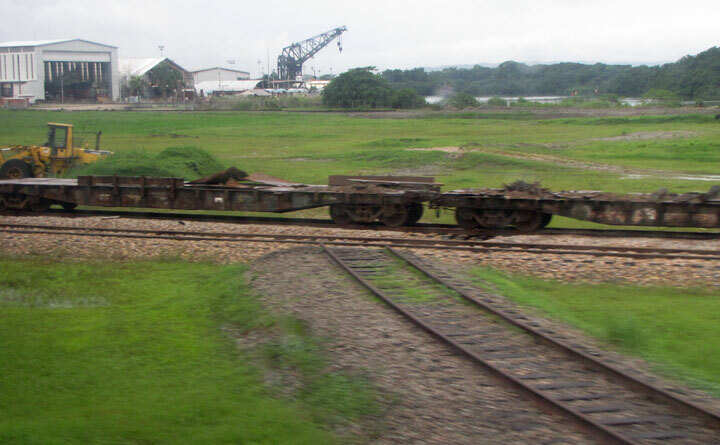 It is estimated that from 5,000 to 10,000 people may have died in construction of the railroad, though the Panama Railway company kept no official count and the total may be higher or lower. Cholera, malaria and yellow fever killed thousands of workers. These railroad workers were from the United States, Europe, Colombia, China, the Caribbean islands, and also included some African slaves. Many of these workers had come to Panama to seek their fortune, and had arrived with little or no identification. Many died with no known next of kin, nor permanent address, nor even a known last name. Disease and exhaustion took a heavy toll on the workers. Because it was not known that mosquitoes, which thrived in Panama's swampy conditions, were spreading the disease, no attempts were made to eliminate the mosquitoes or prevent them from biting the workers--that would be the great breakthrough found by Carlos Finlay, Walter Reed forty years in the future. The disposal of unidentifiable bodies was a boon to mostly paid for the medical facilities. Medical schools and teaching hospitals needed cadavers to train budding physicians, and paid handsomely for anonymous bodies pickled in barrels shipped up from the tropics. The Panama Railroad Company itself sold the corpses abroad, and the income generated was sufficient to maintain the Company's own hospital. 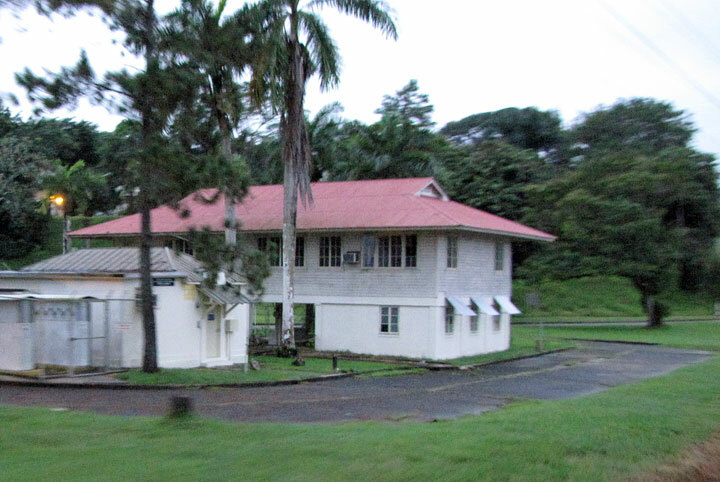 A journalist reported sighting the chief doctor at the Panama Railroad Company's hospital conscientiously bleaching skeletons of dead workers, in hopes of compiling a skeletal museum of all the known races working on the railroad. Upon completion, the 48 mi (77 km) long railway was proclaimed an engineering marvel of the era. The line was eventually built as double track. 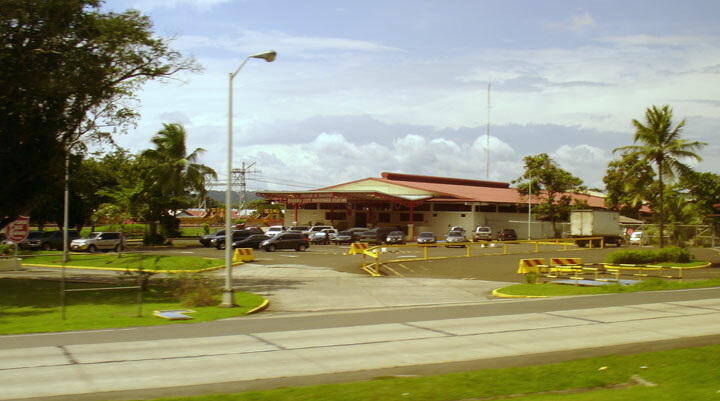 The Atlantic terminal is in Colón (aka Aspinwall); the Pacific in Panama City. Until the opening of the Panama Canal, it carried the heaviest volume of freight per unit length of any railroad in the world. 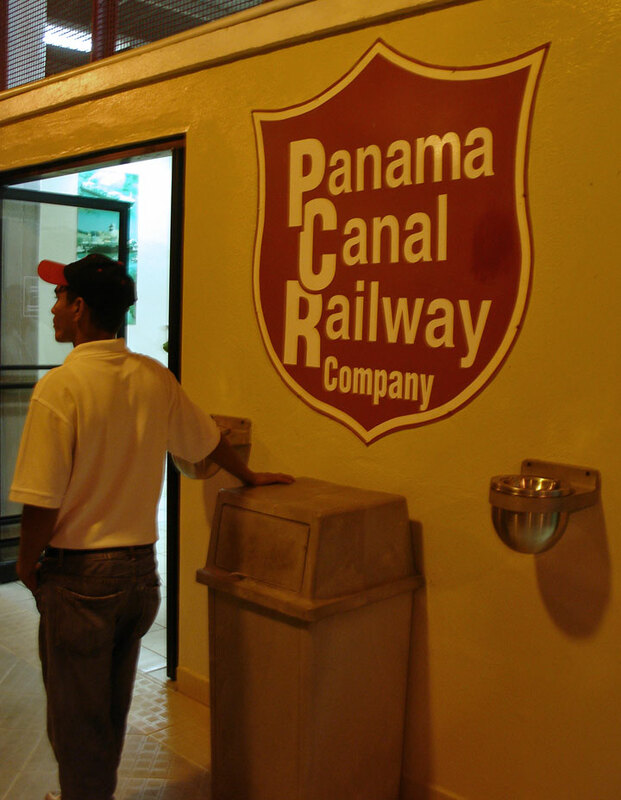 The existence of the railway was one of the keys to the selection of Panama as the site of the canal. 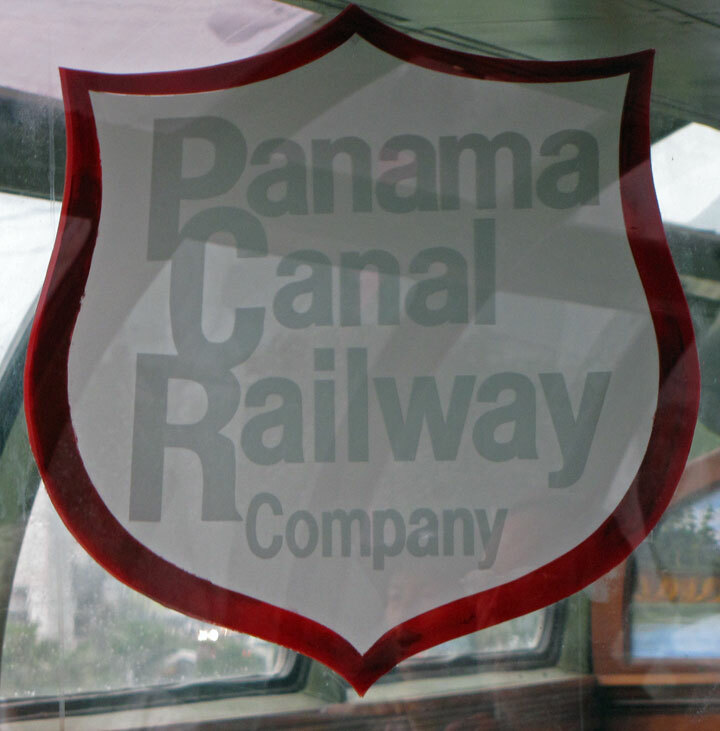 In 1881 the French Compagnie Universelle du Canal Interocéanique purchased controlling interest in the Panama Railway Company. In 1904 the United States government under Theodore Roosevelt purchased the railway from the French canal company. At the time railway assets included some 75 miles (121 km) of track, 35 locomotives, 30 passenger cars, and 900 freight cars. Much of this equipment was worn out or obsolete and had to be scrapped. 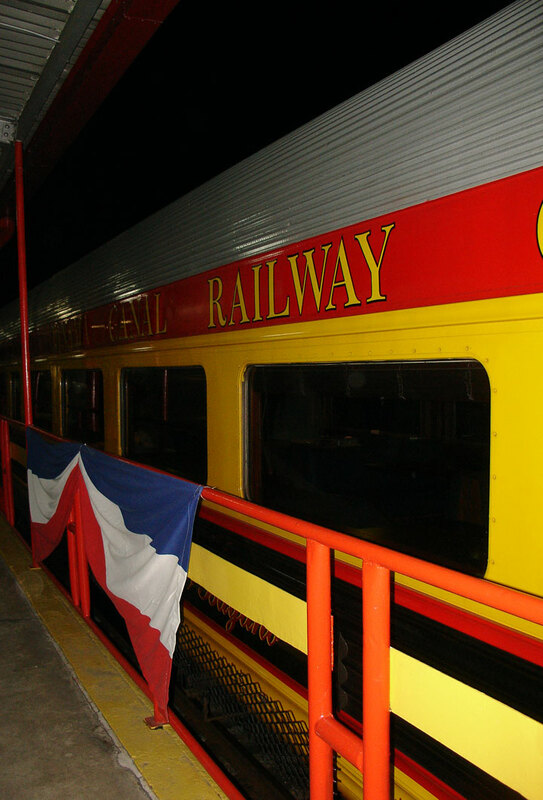 The Panama Railway also operated a significant shipping line, connecting its service with New York and San Francisco. The shipping service was greatly expanded when canal construction began. Ships included the SS Cristobel and the SS Ancon which became the the first two ships to cross the completed canal in 1914. The construction of the Panama Canal was envisioned by John Frank Stevens, chief American railroad construction engineer, as a massive earth moving project using the railroad as efficiently as possible. Stevens wanted the railroad to use the biggest and heaviest duty equipment possible. The French equipment was nearly all judged obsolete, worn out, too light duty and nearly all their railroad equipment was not built for heavy duty use. Ironically, some of this French equipment was melted down and converted into medals presented to men working on the Panama Canal. The railroad, starting in 1904, had to be massively upgraded with heavy duty double tracked rails over most of the line to accommodate all the new rolling stock of about 115 heavy duty locomotives, 2,300 dirt spoils railroad cars and 102 railroad mounted steam shovels brought in from the United States and elsewhere. The steam shovels were some of the largest in the world when they were introduced. The new railroad closely paralleled the canal where it could and was moved and reconstructed where it interfered with the canal work. 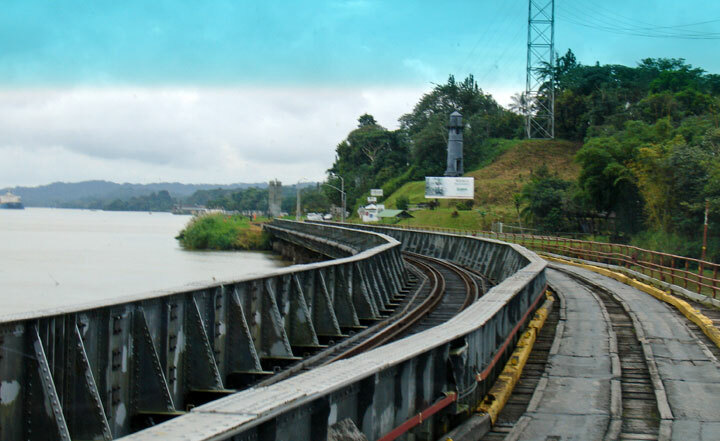 In many places the new Lake Gatun flooded over the original rail line and a new rail line had to be raised above the water by massive dirt fills and bridges. In addition to moving and expanding the railroad where needed, considerable track additions and extensive machine shops and maintenance facilities were added and other up grades were made to the rail system. 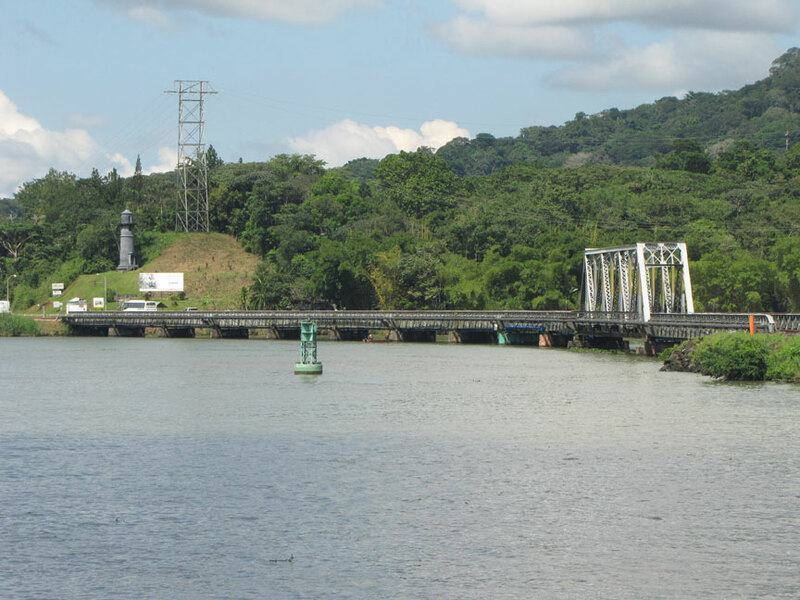 These extensive improvements to the system were started at about the same time the extensive mosquito abatement projects were undertaken to make it safer to work in Panama. When the mosquitoes were under control much of the railroad was ready to go to work. 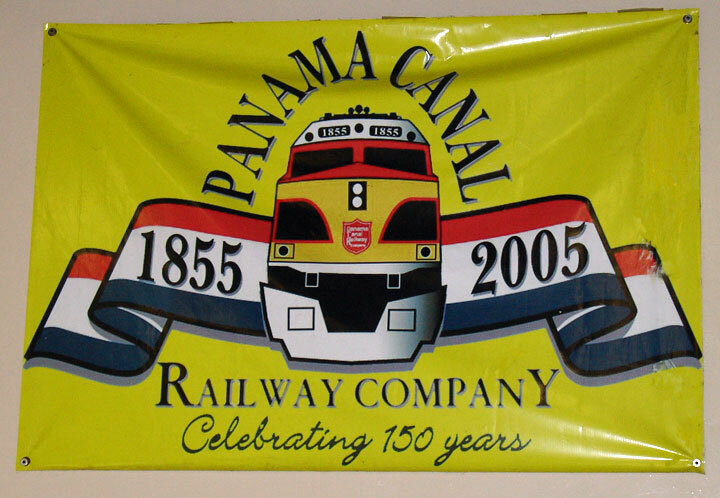 The railway greatly assisted the building of the Panama Canal. Besides hauling all the millions of tons of men, equipment and supplies the railroad did much more. Essentially all of the hundreds of millions of cubic yards of material removed from the required canal cuts were broken up by explosives, loaded by steam shovels, mounted on one set of railroad tracks, and loaded onto rail cars and hauled out by locomotives pulling the spoils cars running on parallel tracks. Most of the cars carrying the dirt spoils were wooden flat cars lined with steel floors that used a crude but amazingly effective unloading device--the Lidgerwood system. 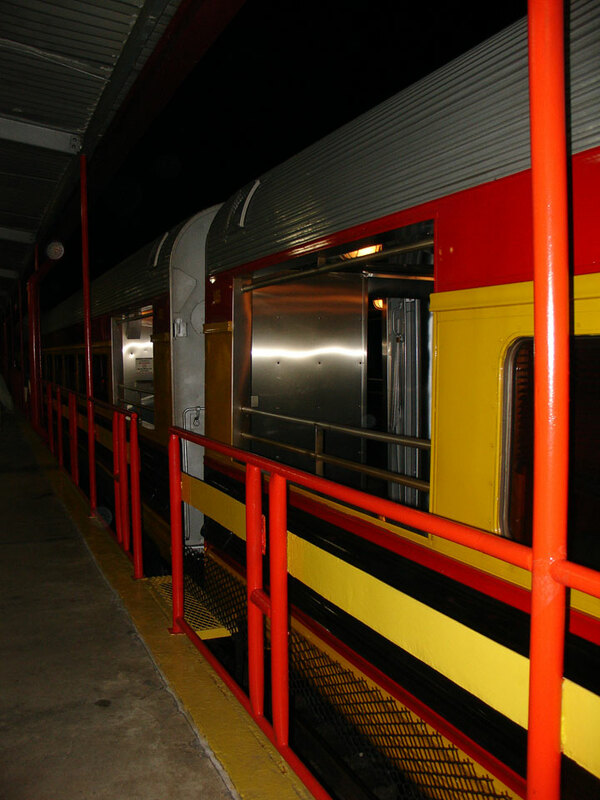 The railroad cars had only one side and steel aprons bridged the spaces between the cars. The rock and dirt was first blasted loose by explosives. Two sets of tracks were then built or moved up to where the loosened material lay. The steam shovels, moving on one set of tracks, picked up the loosened dirt and then piled it on the flat cars traveling on a parallel set of tracks. The dirt was piled high up against the one closed side of the car. The train moved forward as the cars were filled until all cars were filled. A typical train had twenty dirt cars arranged as essentially one long boxcar. On arrival of the train at one of the approximately 60 different dumping grounds a three-ton steel plow was put on the last car (or a car carrying the plow was attached as the last car) and a huge winch with a braided steel cable stretching the length of all cars was attached to the engine. The winch, powered by the train’s steam engine, pulled the plow the length of the dirt loaded train by winching up the steel cable. The plow scraped the dirt off the railroad cars allowing the entire train load of dirt cars to be unloaded in about ten minutes or less. The plow and winch were then detached for use on another train. Another plow, mounted on a steam engine, then plowed the dirt spoils away from the track. When the fill got large enough the track was relocated on top of the old fill to allow almost continuous unloading of new fill with a minimum of effort. When the steam shovels or dirt trains needed to move to a new section, techniques were developed by William Bierd, former head of the Panama Railroad, to pick up large sections of track and their attached ties by large steam powered cranes and relocate them intact--without disassembling and rebuilding the track. A dozen men could move a mile of track a day--the work previously done by up to 600 men. This allowed the tracks used by both the steam shovels and dirt trains to be quickly moved to where ever it needed to go. While constructing the Gaillard Cut, about 160 loaded dirt trains went out of the cut daily, and returned empty—a train about every one and half minutes of the day. The railroads, steam shovels, enormous steam powered cranes, rock crushers, cement mixers, dredges, and pneumatic power drills used to drill holes for explosives (about 30,000,000 pounds (14,000,000 kg) were used) were some of the new pieces of construction equipment used to construct the canal. Nearly all this new equipment was built by new, extensive machine building technology developed and built in the United States. In addition the canal used large refrigeration systems for making ice, extensive large electrical motors to power the pumps and controls on the canal's locks and other new technology. They built extensive electrical generation and distribution systems--one of the first wide scale uses of large electrical motors. Electrical powered donkey engines pulled the ships through the locks on railroad tracks laid parallel to the locks. New technology, not available in the 1850s, allowed massive earth cuts and fills to be used on the new railroad that were many times larger than those done in the original 1851-1855 construction. 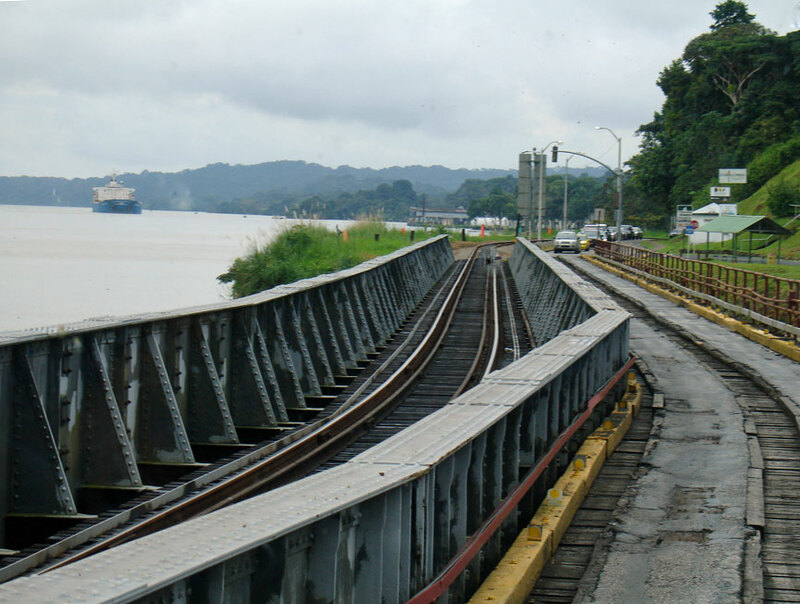 The rebuilt, much improved and often rerouted Panama Railway continued along side the new canal and across Gatun Lake. The railroad was completed in its final configuration in 1912, two years before the canal, at a cost of $9,000,000--$1,000,000 more than the original. 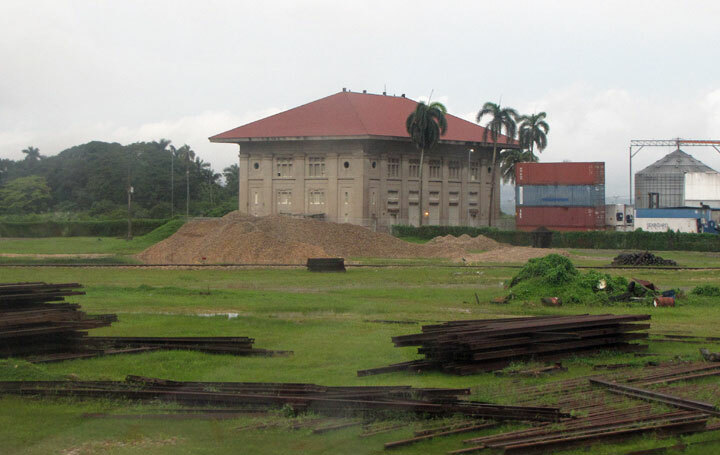 After World War II few additional improvements were made to the Panama Railway, and it declined after the U.S. government handed over control to the government of Panama in 1979. 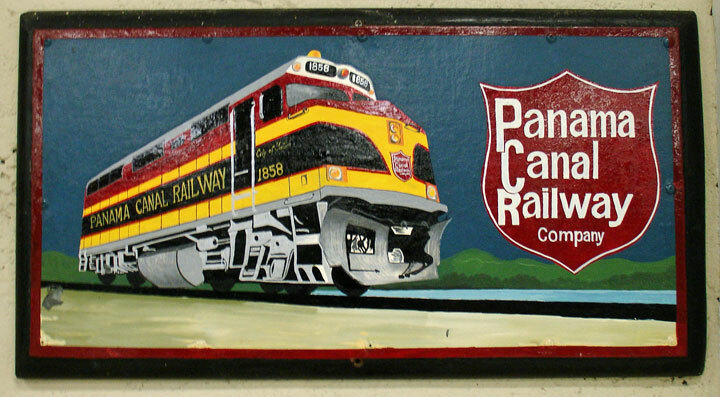 On June 19, 1998 (1998-06-19), the government of Panama turned over control to the private Panama Canal Railway Company ("PCRC"), a joint venture between the Kansas City Southern Railroad and privately held Lanigan Holdings, LLC. 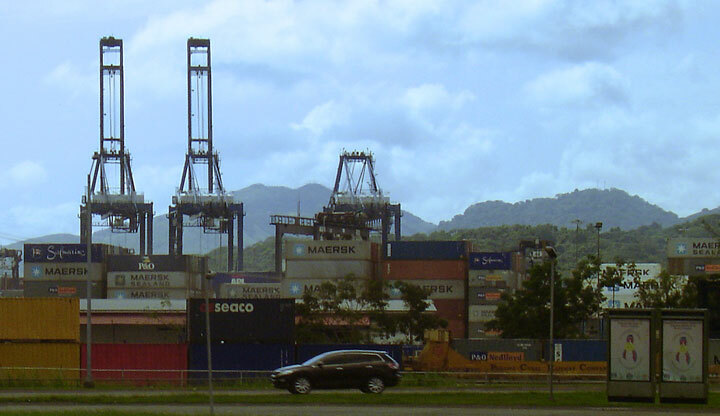 In 2000 and 2001 a large project upgraded the railway to handle large shipping containers, to complement the Panama Canal in cargo transport. The line is now single track with some strategically placed sections of double track. Motive power as of August 2009 (2009-08) consists of ten former Amtrak F40PHs, five EMD SD60s and two EMD SD40-2s from the Kansas City Southern Railroad, and one GP10. 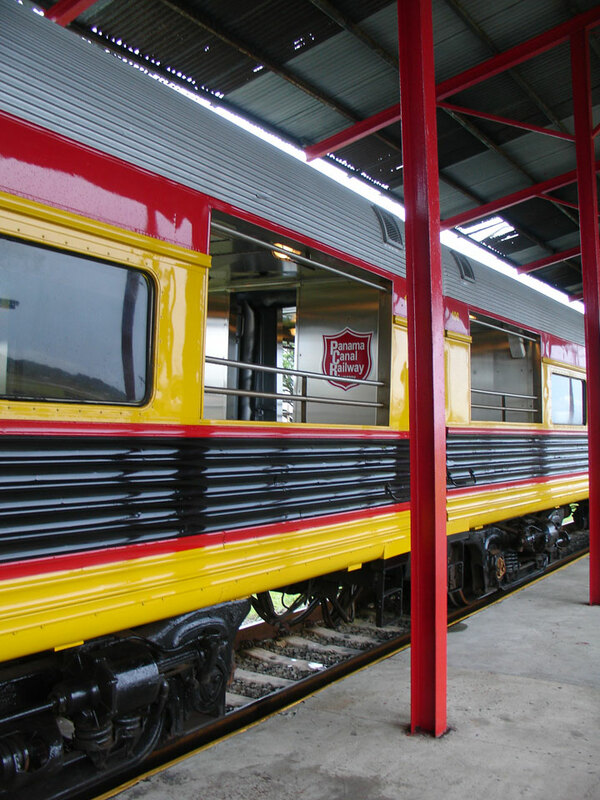 The railroad also has a fleet of several historic passenger cars in service, including PCRC #102, which is a vintage dome car first built for the Southern Pacific Railroad in 1938.